Canadian brand Biknd has created a sophisticated bike case that is perfect for any cyclist who wants to take a bike on a plane, safely store it at home, or pack it up for an epic train or bus journey. 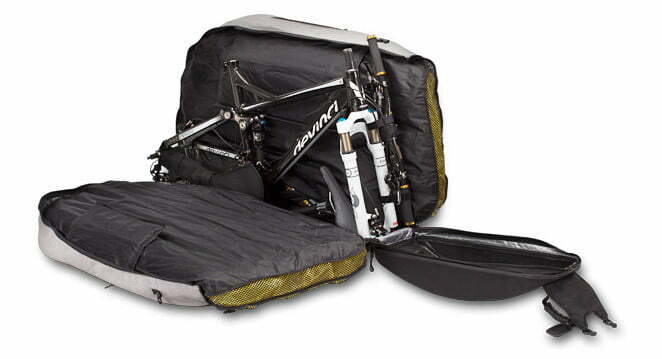 The Helium Bike Case ($600) protects your bike with inflatable air pockets and is designed to be lightweight and easy to carry. Developed with pro cyclists in mind, the case has compartments for everything from an extra wheel set to your helmet and bike pump. While obvious disassembly of your bike is required, packing up your bike won’t necessitate any adjustment of its components. The case is constructed from high-quality nylon and polyester and comes with its own built-in air pump for inflating the protection pads. It’ may not be a good investment for the commuter cyclist, but anyone who has dealt with bikes and air travel will no doubt appreciate the compact protection of Biknd’s Helium case.